I can really not get enough of cute, animal toppers. On cakes, jam-jars, you name it, whack those little guys on! 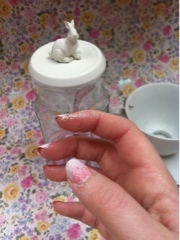 Here's a super easy bunny top jar tutorial if you're looking for something to keep you busy this weekend. The eagle eyed among you may remember it from Easter a few years back but I thought they'd make great little Christmas gifts for those on a budget (raises hand!) so re-visiting with some added, Seasonal sparkle! Here my critter of choice was a bunny but I'd love to do some more festive ones with little deers and bears. Make sure your jar and lid are totally clean and dry, left over stir fry sauce will ruin the look! Put the cleaned jar to one side. 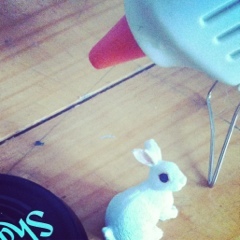 Glue the bunny into the middle of the lid, clean any ooze at the base away quickly as it will show up (learned the hard way!) when you paint it later. Leave to dry completely before painting. Find a well ventilated area, preferably outside, and spray the entire lid and bunny all over, thin and even is best, allow to dry then give another coat if required. Adorn you jar with it's crowning glory and fill with something sweet.